Reading and share top 137 famous quotes and sayings about Imperfections by famous authors and people. Browse top 137 famous quotes and sayings about Imperfections by most favorite authors. 1. "Not everyone sees you the way you do. Sometimes our imperfections are what makes us special. - Tripp"
2. "Love the creatures for the sake of God and not for themselves. You will never become angry or impatient if you love them for the sake of God. Humanity is not perfect. There are imperfections in every human being, and you will always become unhappy if you look toward the people themselves. But if you look toward God, you will love them and be kind to them, for the world of God is the world of perfection and complete mercy. Therefore, do not look at the shortcomings of anybody; see with the sight of forgiveness. The imperfect eye beholds imperfections. The eye that covers faults looks toward the Creator of souls. He created them, trains and provides for them, endows them with capacity and life, sight and hearing; therefore, they are the signs of His grandeur. You must love and be kind to everybody, care for the poor, protect the weak, heal the sick, teach and educate the ignorant." 3. "We can be confident in our dealings with the world when what the world sees is the outer person, with all the outer person's defences: the intimacy of a love affair is a different matter altogether. And who might not feel just the slightest bit insecure under the gaze of a lover--a gaze which falls on birthmarks, on blemishes physical and psychological, on our imperfections and impatience, on our human vulnerability?" 4. "This is my gift to you, this story that is also a song, these words that are a part of Fokir. Such flaws as there are in my rendition of it I do not regret, for perhaps they will prevent me from fading from sight, as a good translator should. For once, I shall be glad if my imperfections render me visible." 5. "Imperfections are attractive when their owners are happy with them." 6. "I believe I owe all the best parts of my adulthood to embracing my imperfections and showcasing them." 7. "We achieve some measure of adulthood when we recognize our parents as they really were, without sentimentalizing or mythologizing, but also without blaming them unfairly for our imperfections. Maturity entails a readiness, painful and wrenching though it may be, to look squarely into the long dark places, into the fearsome shadows. In this act of ancestral remembrance and acceptance may be found a light by which to see our children safely home." 8. "A rose without its thorns would be too perfect to be admired. Similarly, people without imperfections would be apathetic." 9. "We keep on being told that religion, whatever its imperfections, at least instills morality. On every side, there is conclusive evidence that the contrary is the case and that faith causes people to be more mean, more selfish, and perhaps above all, more stupid." 10. "Are imperfections is which make we grate." 11. 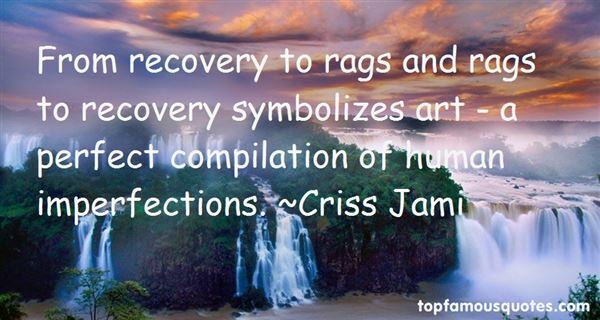 "From recovery to rags and rags to recovery symbolizes art - a perfect compilation of human imperfections." 12. "All men have their frailties; and whoever looks for a friend without imperfections, will never find what he seeks." 13. "Most of us are painfully aware that we're not perfect parents. We're also deeply grieved that we don't have perfect kids. But the remedy to our mutual imperfections isn't more law, even if it seems to produce tidy or polite children. Christian children (and their parents) don't need to learn to be "nice." They need death and resurrection and a Savior who has gone before them as a faithful high priest, who was a child himself, and who lived and died perfectly in their place. They need a Savior who extends the offer of complete forgiveness, total righteousness, and indissoluble adoption to all who will believe. This is the message we all need. We need the gospel of grace and the grace of the gospel. Children can't use the law any more than we can, because they will respond to it the same way we do. They'll ignore it or bend it or obey it outwardly for selfish purposes, but this one thing is certain: they won't obey it from the heart, because they can't. That's why Jesus had to die." 14. 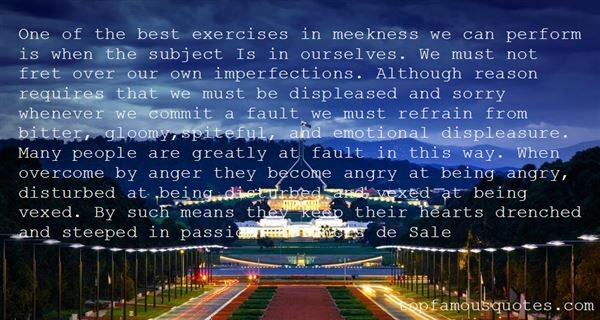 "One of the best exercises in meekness we can perform is when the subject Is in ourselves. We must not fret over our own imperfections. Although reason requires that we must be displeased and sorry whenever we commit a fault we must refrain from bitter, gloomy,spiteful, and emotional displeasure. Many people are greatly at fault in this way. When overcome by anger they become angry at being angry, disturbed at being disturbed and vexed at being vexed. By such means they keep their hearts drenched and steeped in passion." 15. "Be patient with everyone, but above all with yourself...do not be disheartened by your imperfections, but always rise up with fresh courage." 16. "Today I believe in the possibility of love; that is why I endeavor to trace its imperfections, its perversions." 17. "The truth is, the person I've been hating more than anyone is myself. It is so easy. So easy to look in the mirror at all my imperfections and think of all the ways I fall short of someone..."
18. 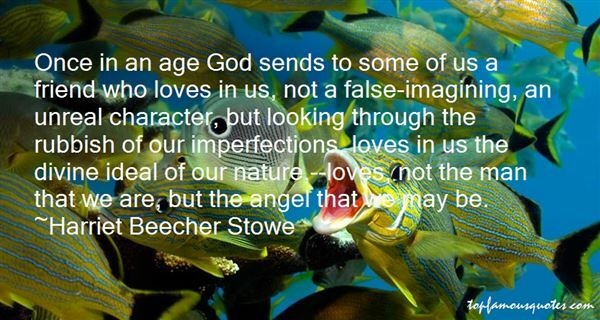 "Once in an age God sends to some of us a friend who loves in us, not a false-imagining, an unreal character, but looking through the rubbish of our imperfections, loves in us the divine ideal of our nature,--loves, not the man that we are, but the angel that we may be." 19. "You're so convinced you'll disappoint people if you show them that you're not perfect. You don't realize you are perfect. Your imperfections are what make you perfect. They make you you. That's what people love. It's what I love too." 20. "Remember this: No one is looking at your imperfections; they're all too busy worrying about their own." 22. "No one is perfect. Sometimes, it is the imperfections that make us more alive than those around us. It's the happiness of truly breathing and living in freedom of ourselves. Even though we may look broken to the world, there is always someone who sees us as we truly are, and helps us to create our whole being." 23. "I want to be softened, not stiff. Pliable, not rigid. I don't want anyone to look at my life and think it is perfect or, worse, that I want them to think it is perfect. Instead, I want anything that is unapproachable or harsh in me to be scrubbed away by the salt and the sand, revealing the imperfections, the brokenness, the cracks. Not because I am proud of those parts, but because I know it is real. Like the Skin Horse or the Velveteen Rabbit, I am shabby because I live life, because I am loved, and because it is all work - living and loving and being loved, being transformed, being worn and faded"
24. "No human face is exactly the same in its lines on each side, no leaf perfect in its lobes, no branch in its symmetry. All admit irregularity as they imply change; and to banish imperfection is to destroy expression, to check exertion, to paralyze vitality. All things are literally better, lovelier, and more beloved for the imperfections which have been divinely appointed, that the law of human life may be Effort, and the law of human judgment, Mercy." 25. "What is history? Any thoughts, Webster? ''History is the lies of the victors,' I replied, a little too quickly. 'Yes, I was rather afraid you'd say that. Well, as long as you remember that it is also the self-delusions of the defeated. ...'Finn? ''"History is that certainty produced at the point where the imperfections of memory meet the inadequacies of documentation." (quoting Patrick Lagrange)"
26. "History is that certainty produced at the point where the imperfections of memory meet the inadequacies of documentation." 27. "You have many flaws, he announced... "But there was one flaw that made all the other imperfections pale in comparison.""Was?" she asked. "I don't have this flaw any longer? ""No, you don't. ""Pray tell," she muttered in exasperation, "what was this terrible flaw? "He grinned. "You used to be English." 28. "There are many who criticise the United Nations. And those of us who know this institution well know that it is not immune from criticism. But those who argue against the United Nations advance no credible argument as to what should replace it. Whatever its imperfections, the United Nations represents a necessary democracy of states." 29. "Deities are invented by fallible and finite beings in the hope and desire to create immortal perfection; unfortunately, such deities only reflect their creators and inspire their followers to similar imperfections." 30. "Parenting has nothing to do with perfection. Perfection isn't even the goal, not for us, not for our children. Learning together to live well in an imperfect world, loving each other despite or even because of our imperfections, and growing as humans while we grow our little humans, those are the goals of gentle parenting. So don't ask yourself at the end of the day if you did everything right. Ask yourself what you learned and how well you loved, then grow from your answer. That is perfect parenting." 31. "I thank God every day, all day, for everything He has done & everything He is going to do. I AM NOT PERFECT! I repeat, I AM NOT PERFECT. But even in my imperfections & my ways, I acknowledge Him, I love Him with all my heart & I have great faith in Him, always." 32. "Every song is for you. The good ones, the bad ones – they are all for you. You are in my thoughts the moment I wake each day, you are in my dreams at night. You are everything I have ever wanted. I've even looked for your imperfections in other women. Even that made me feel closer to you. Any piece of you I could get, I would take, even if it wasn't real." 33. "My imperfections and failures are as much a blessing from God as my successes and my talents and I lay them both at his feet." 34. "When you work on your own life, you are less likely to hyper focus on the imperfections of your husband." 35. "We love our country, not because it is perfect in everything, but it manages to touch our heart despite all its imperfections in everything!" 36. "I don't want to be perfect, but I do want to be a role model. My mom always tells me that imperfections equal beauty. All of us are imperfect." 37. "Primary purposes of a mirror: (1) To help civilized men realize their imperfections, and, (2) To help the imperfect hide their imperfections." 38. "You will not dishonor the divine perfections by judgments unworthy of them, provided you never judge of Him by yourself, provided you do not ascribe to the Creator the imperfections and limitations of created beings." 39. "Even when we strive for perfection, life is nothing more than an attempt to achieve it through a series of greater or smaller imperfections." 40. "He who should perceive a ‘minute' full of perfection must work himself up to address the minutest imperfections." 41. "The study of human institutions is always a search for the most tolerable imperfections." 42. "I am not perfect. Are you? Let us accept the fact that nobody is perfect. Let us learn to accept our imperfections as well as those of others. - RVM." 43. "Dont brag about being perfect..imperfections are what makes you attractive.."
44. "For all its ridiculous imperfections, life is pretty damn perfect sometimes." 45. "I am full of mistakes and imperfections and therefore I am real ..."
46. "The big thing I've discovered, the big secret, is that it's all about how happy you are. It's the ultimate thing. People forget your flaws and imperfections if they see you're happy." 47. "Our love is perfect. And even though we may not be, our love creates a bridge that spans over our imperfections and joins us where it matters." 48. "All beauty must have its imperfections, all happiness its share of sorrow." 49. "Our imperfections make us unique as surely as our strengths." 50. "Filth and vermin though they shock the over-nice are imperfections of the flesh closely related in the just imagination of the poet to excessive cleanliness." Y entonces pienso que, si el mundo es un gran mecanismo, tiene que haber alguna razón para que yo esté en él."